The whole of September here at Michele Made Me is dedicated to a celebration of the simple beauty, the ruggedness and the plain wonderfulness of that versatile material, DENIM. 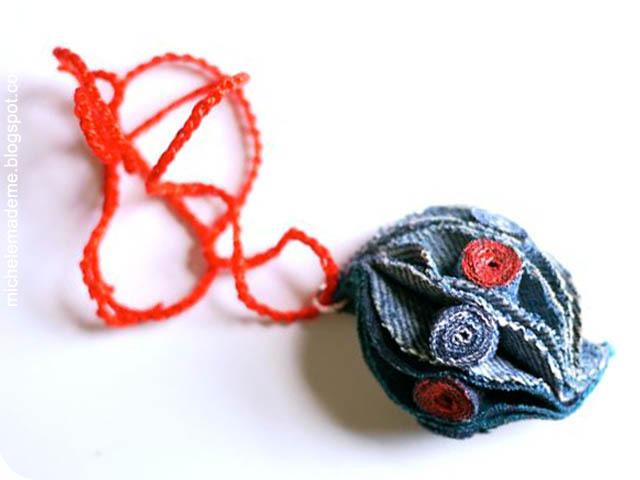 Specifically, the focus is on the recycling of old jeans into pretty new things. That’s right baby. The plan I’ve laid out for the month is HERE by the way, in case you want to know more! You don’t mind if I just jump in and get the crafts rolling do you? I mean, let’s be honest, that is why we’re here. So let us delay no longer. Let us DO it man. 1. Cut 5 strips measuring 1/4″(6 mm) wide and about 6″(15 cm) long. One at a time apply glue along the length of a strip. 2. Coil up the strip. 3. This makes a denim bead. Repeat steps 1-3 for the remaining 4 strips. 4. 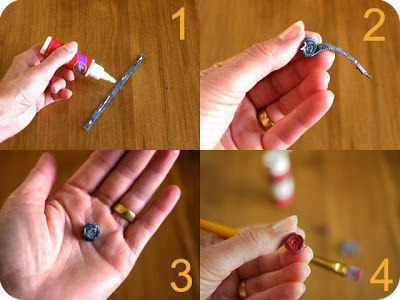 Apply paint to one flat face of 2 of the beads (or however many you’d like to paint). 5. 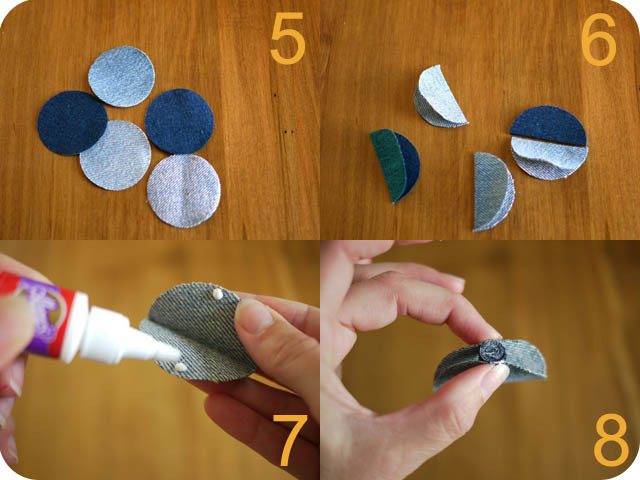 Using your circle template, draw out 5 circles onto your denim scraps and cut them out. 6. 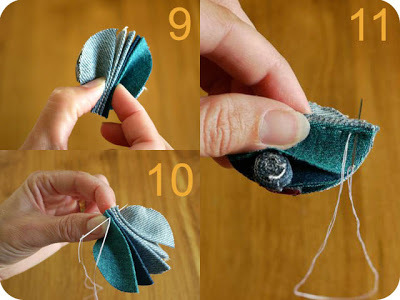 Fold circles in half. Press. 7. 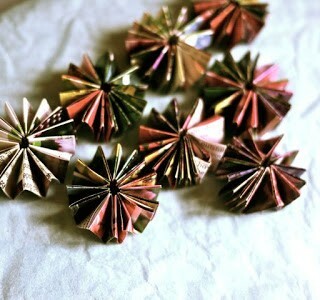 Unfold a circle. Apply glue to the inside top and bottom of the circle. 8. 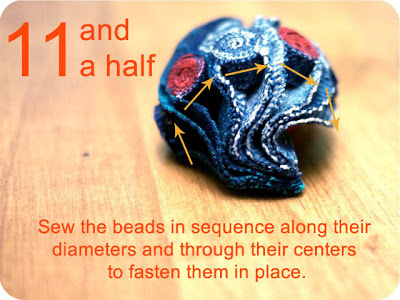 Take a denim bead and sandwich it between the top and bottom of the circle as in #8. Hold for a few seconds. Repeat steps 7 and 8 with all circles. 9. Take all folded and beaded circles and hold them with their spines lined up as in #9. 10. 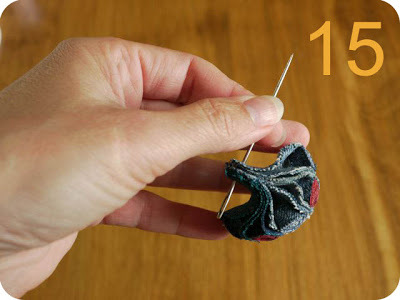 Take a threaded needle and starting at one end, stitch your bundle together along the spine using a running stitch. 11. Stitch along the whole spine until you get to the other end. Tie off with a knot. Hide your thread end by sinking it into the spine. 11-1/2. This step is hard to explain. But I’ve got to try! With the help of small needle nose pliers to pull the needle and thread though the beads, start at one of the outer circles and stitch with needle and thread, through the diameter of each bead to the other side of the pendant. This will ensure that the beads stay in place within the circle sandwiches. 12. Break out the fabric stiffener and a brush. Pour some stiffener onto a plate or plastic cover. 13. Brush the stiffener generously onto and into the pendant. If necessary use a smaller brush to get the stiffener into all those nooks and crannies. Let the stiffener dry (sort of). I threw my pendant in the microwave for 30 second increments to heat it up and promote drying. 14. 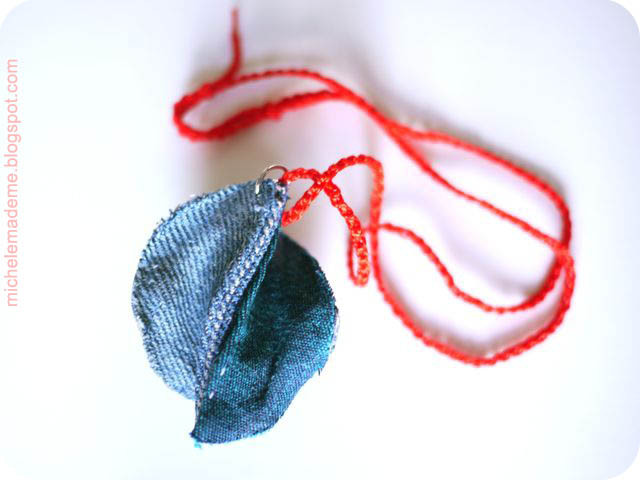 When the pendant is dry (sort of), shape it between your fingers to the desired shape. I was going for a shell-like shape. When I was pleased with the shape, I let the pendant dry completely. I used a LOT of stiffener so my pendant is quite hard. 15. Make a hole a one end of your pendant to accomodate a jump ring. I used a large needle to make my hole. 16. Open up the jump ring. Insert it into your hole. Close up the jump ring! 17. 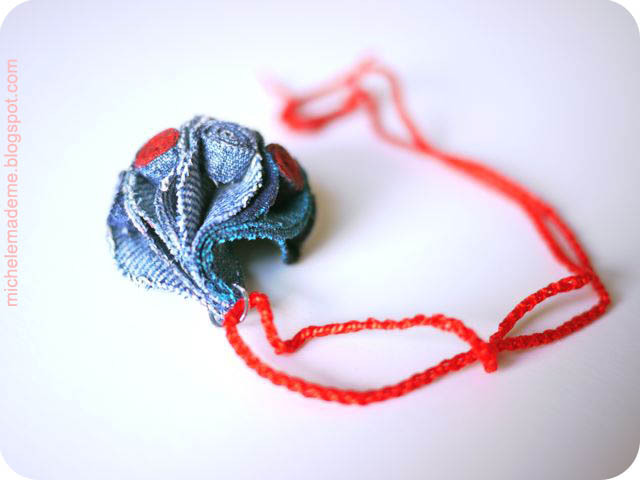 I crocheted a simple chain for my pendant using crochet cotton but you could use any nice piece of cord. Put the cord through the jump ring. Make a rudimentary clasp by taking one end of the cord and tying it to the other end of the cord (a few inches down from the end) with a simple knot. 18. Repeat that last sentence with the other end of the cord to complete the clasp. 19. This makes a nifty adjustable clasp. 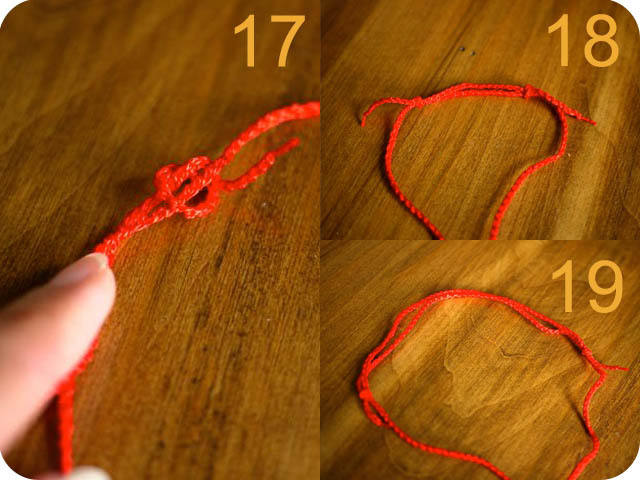 To adjust the length of your cord, simply slide the knots over the cord either closer or further from each other. Could it possibly be done? Why yes, I think you can call that a pendant! Yippee cayay! It reminds one of sea critters, doesn’t it? Have you ever made sea creatures or brains out of denim? Tell me all about it. 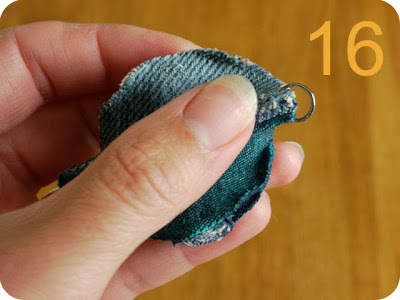 Or better yet, take a picture of your denim thing. And then, upload it to the Drop-Dead Denim Flickr group where I can admire it! Well, you have a restful weekend now. I will see you again on Monday! Funny – when I saw the top – I didn't see shell but when I saw the back, I did. 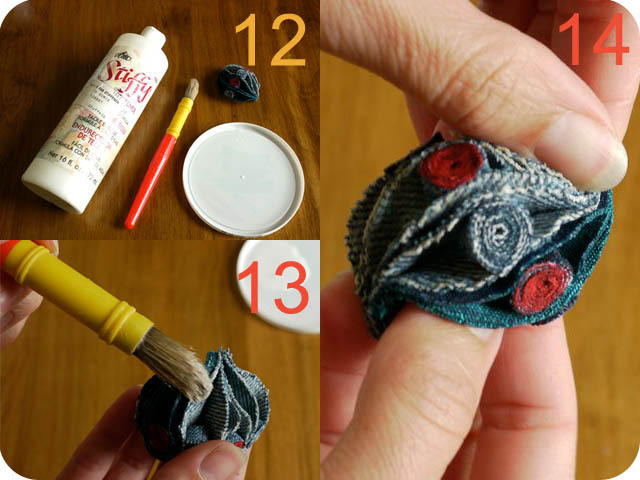 Awesome tutorial-this is so creative & pretty. 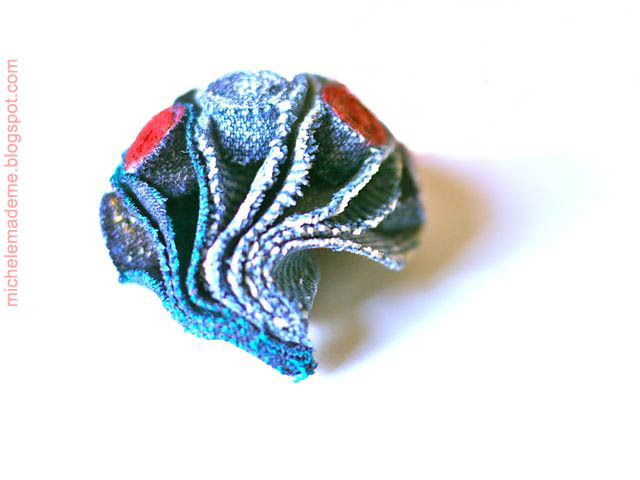 I have never made brains or sea creatures out of denim! 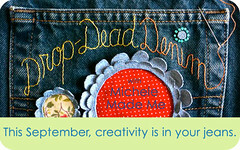 Although I have made a couple of cute bags-I may have to do another one in honor of Drop Dead Denim! 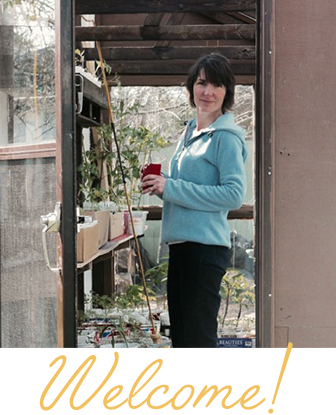 This is fantastic and so easy to make Michele! Love it! 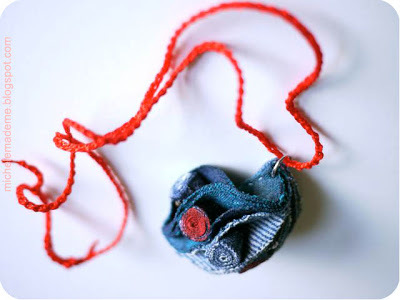 What a great project and a wonderful idea for a series on denim! This is very cute Michele!! Love it!! A gorgeous shape! 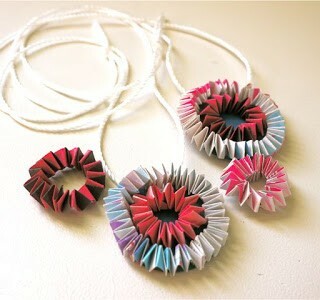 And fascinating technique – you always give such a unique spin to simple shapes and materials! Just beautiful, Michele. super cute..how you cut the circles of denim so smooth….?? 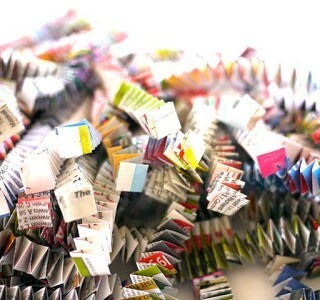 Love the structure of this piece and how you obtained a three dimensional effect. I am trying to figure out if I could adapt it to make a fortune cookie as well. I have been looking forward to this series, you always amaze. Wow, that is so cool and creative! Cute jewelry piece! 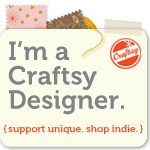 We're used to you sewing, but making jewelry?? Neato!! Looking forward to everyones take on denim. Love your line up. Very pretty, Michele. And so clever as always. Great start to this series. Michele, you make making everything so much fun. I just love reading what you write, every time. This is yet another amazing idea from you. Thanks. I love the little teeny denim beads!